Aims: To investigate the extent of socioeconomic inequalities in the incidence of very preterm birth over the past decade. Methods: Ecological study of all 549 618 births in the former Trent health region, UK, from 1 January 1994 to 31 December 2003. All singleton births of 22+0 to 32+6 weeks gestation (7 185 births) were identified from population surveys of neonatal services and stillbirths. Poisson regression was used to calculate incidence of very preterm birth (22–32 weeks) and extremely preterm birth (22–28 weeks) by year of birth and decile of deprivation (child poverty section of the Index of Multiple Deprivation). Results: Incidence of very preterm singleton birth rose from 11.9 per 1000 births in 1994 to 13.7 per 1000 births in 2003. Those from the most deprived decile were at nearly twice the risk of very preterm birth compared with those from the least deprived decile, with 16.4 per 1000 births in the most deprived decile compared with 8.5 per 1000 births in the least deprived decile (incidence rate ratio 1.94; 95% CI (1.73 to 2.17)). This deprivation gap remained unchanged throughout the 10-year period. The magnitude of socio-economic inequalities was the same for extremely preterm births (22–28 weeks incidence rate ratio 1.94; 95% CI (1.62 to 2.32)). Conclusions: This large, unique dataset of very preterm births shows wide socio-economic inequalities that persist over time. These findings are likely to have consequences on the burden of long-term morbidity. Our research can assist future healthcare planning, the monitoring of socio-economic inequalities and the targeting of interventions in order to reduce this persistent deprivation gap. Research into socio-economic inequalities in very preterm birth in the UK has been hampered until very recently by the lack of routinely-collected data on gestational age. National studies have shown socio-economic inequalities in low birth weight, congenital anomalies and infant death.5–8 As birth weight is routinely collected, it is often used as a proxy for preterm birth, but preterm birth and fetal growth have different aetiologies,9 with only around two thirds of low birthweight babies being preterm. Small-scale UK studies of very preterm birth have found contradictory evidence of socio-economic variation,10,11 while a national study of preterm birth in New Zealand12 has shown that historically, socio-economic inequalities existed, but that these have diminished with recent increases in the incidence of preterm birth among more affluent women. In order to estimate service needs, monitor inequalities over time, and target interventions at those who need services most, large-scale studies of very preterm birth are needed. We use data from two established surveys covering a population of approximately 55 000 births per year to explore socio-economic inequalities in very preterm birth over a 10-year period (1994–2003). Data on very preterm birth were obtained from two sources—the Trent Neonatal Survey13 and the Confidential Enquiry into Stillbirth and Infant Death.14 The Trent Neonatal Survey includes information on all babies that receive neonatal care in the former Trent health region of the UK that satisfy key criteria, including all births of 32 weeks’ gestation or less, has ethics approval and Patient Information Advisory Group approval to collect data without individual consent. These data were then combined with data from the Confidential Enquiry into Stillbirth and Infant Death to identify babies of 32 weeks’ gestation or less who died before admission to neonatal care, including early neonatal deaths, late fetal losses, stillbirths and antepartum deaths. Published estimates of the incidence of preterm birth from around the world have been affected by a variety of factors, such as the method of assessment of gestational age, the completeness of birth registrations and policies on the viability of extremely preterm births and their documentation. We estimated incidence on the basis of all very preterm births alive at the onset of labour including stillbirths, but excluding antepartum deaths (ie we included those births with the potential to be born alive at the time they came under the care of the relevant maternity service). Consequently, this removes any potential bias resulting from a variable approach to obstetric management and/or neonatal resuscitation of infants of differing socio-economic status. We defined gestation according to the hierarchy specified by the National Confidential Enquiry into Stillbirths and Deaths in Infancy Programme: mother certain of her dates (most reliable); early dating scan (less than 20 weeks’ gestation); late dating scan (more than 20 weeks’ gestation); and postnatal examination (least reliable). If the difference between maternal date and early dating scan was more than 7 days, we chose the early dating scan. The main analyses were restricted to singleton births as the incidence of multiple births—for example, twins and triplets—may be affected by socio-economic factors (eg access to or ability to pay for infertility treatment) and the outcome of multiple births is affected by a number of factors relating directly to multiplicity. Results for very preterm (22–32 weeks) and extremely preterm (22–28 weeks) births are presented here. Data were obtained from the Office for National Statistics on all births (live and still births) in the Trent region by ward for each year from 1994–2003. For confidentiality reasons, this was the lowest-area-level data available. As the research focused on birth, it was decided to use the Child Poverty Index to measure ward-level deprivation. This is a subset of the income domain of the Index of Multiple Deprivation 200015 based on the percentage of children under 16 in low-income families. All wards in the Trent region were ranked by their deprivation score. Deciles of deprivation were constructed by dividing the wards into ten groups, from the most deprived to the least deprived, with approximately equal numbers of live and still births in each. Each preterm infant was then assigned to a ward of residence based on their mother’s postcode at the time of birth and allocated to the appropriate deprivation decile. Incidence rates and associated confidence intervals were calculated for all very preterm births and extremely preterm births using the data on all live and still births as the denominator. Crude incidence rates were calculated separately by year of birth and decile of deprivation. In order to adjust for changes in incidence of socio-economic differences over time, a Poisson regression model was fitted separately for extremely preterm births and very preterm births. Year of birth was treated as a continuous variable, as a fractional polynomial model showed there was no evidence that the change in incidence over time was not linear. Deprivation decile was treated as a categorical variable. In order to test whether the deprivation gap was homogeneous across the 10-year period, we tested the significance of the interaction terms. We identified 9490 very preterm births of 22–32 weeks’ gestation alive at the onset of labour out of 549 618 births to mothers with a postcode in the Trent region from 1 January 1994 to 31 December 2003. This gives an overall incidence of 17.3 very preterm births per 1000 births (including multiple and singleton births). For singleton births, the incidence of very preterm birth was 13.1 per 1000 births (7185 births, 95% CI 12.8% to 13.4%) and extremely preterm singleton birth was 4.8 per 1000 births (2655 births, 95% CI 4.6 to 5.0). Figure 1 shows that the incidence of very preterm singleton birth has increased over the past decade from 11.9 per 1000 births in 1994 to 13.7 per 1000 births in 2003, with an average increase of 2.2% per year (95% CI 1.4% to 3.0%). This increase is mainly among births between 29–32 weeks, while extremely preterm births (<29 weeks) have changed less with 4.4 births per 1000 in 1994 and 5.0 per 1000 in 2003, an average increase of 1.3% per year (95% CI 0.0% to 2.7%). The incidence of very preterm singleton births increased with increasing deprivation (table 1) from 8.5 very preterm births per 1000 births in the least deprived areas to 16.4 very preterm births per 1000 births among the most deprived area. Births to mothers in the most deprived decile had a 94% higher risk of being very preterm than those in the least deprived decile. 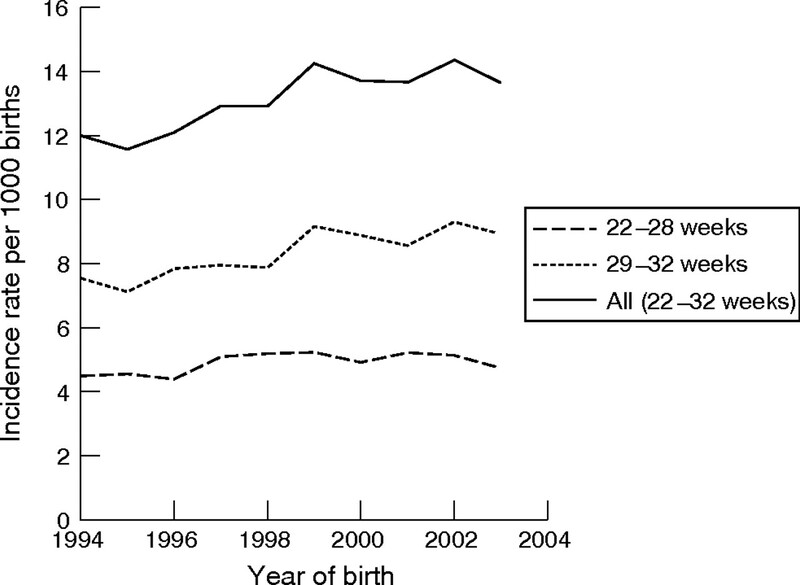 These wide socio-economic inequalities were very similar for extremely preterm births (22–28 weeks). Incidence rate per 1000 births of very preterm birth in the former Trent National Health Service region by gestation and year of birth (1994–2003). The deprivation gap remained unchanged after adjusting for the variation in incidence over time (table 1), with incidence-rate ratio estimates being identical to two decimal places for both the effects of year and deprivation. The fitted model shows the incidence of very preterm birth has increased significantly over the period, with a yearly increase of 2.2% (95% CI 1.4% to 3.0%) risk between 1994 and 2003, ie a 20% increase in risk across the whole period. For extremely preterm birth the increase over time was smaller, with a yearly increase in risk of 1.3% (95% CI 0.0% to 2.7%), 11% over the whole period. The risk of both very preterm and extremely preterm birth for those from the most deprived decile was almost double that of the least deprived decile. There was no evidence that the increase in incidence over time varied by deprivation group (extremely preterm birth χ2 6.09; p = 0.731; very preterm birth: 11.08; p = 0.270). Figure 2 shows the incidence with deprivation over time for the two most extreme deciles and a central decile (decile 5), with a similar increase in incidence over time across deprivation groups. Incidence rate of very preterm birth per 1000 births by year of birth for deprivation deciles 1 (least deprived), 5 and 10 (most deprived). As discussed, variation in the incidence of very preterm birth between studies is often related to the definition of very preterm birth used. However, we were interested in the effect of this on the deprivation gap, so we undertook sensitivity analyses with other definitions of very preterm birth, including and excluding late fetal losses, stillbirths and early neonatal deaths. Although this led to the expected changes in absolute incidence, the patterns over time and socio-economic inequalities were consistent with the findings presented here. We also explored changes in the proportion of live births in each deprivation decile over time, and found that the deciles of deprivation would be virtually identical if they were based on earlier or later years, and therefore such a change is unlikely to account for the patterns seen here. We have shown that there are substantial socioeconomic inequalities in the incidence of very preterm birth with nearly double the incidence in more deprived women compared with the least deprived. We also show there have been substantial rises in the incidence of very preterm birth over the past 10 years, and that these increases have been similar for all deprivation quintiles, such that the deprivation gap remains wide. If the rate of very preterm birth among the least deprived decile was experienced by all women, then the number of very preterm births would be reduced by 30–40%. Consequently, rates of perinatal mortality and morbidity would also be considerably reduced. The socioeconomic differential we have noted is larger than the national New Zealand figures,12 where there was a 66% difference in incidence between the most and least deprived in 1980, which reduced to 32% in 1999 for births of 29–32 weeks gestation. Furthermore, we found no evidence of a reduction in inequalities over time. However, our study was only able to look at the relationship between the incidence of very preterm birth, and deprivation and year of birth. There are factors such as maternal age, parity and previous pregnancy history that are likely to be related to both the incidence of very preterm birth and deprivation, and which may explain part of the large deprivation gap we have shown. Our approach, similarly, did not permit us to explore some of the biological mechanisms that might link “deprivation” (which is a broad term affecting many aspects of environment and lifestyle) and the biological mechanisms that might then result in preterm birth. Green et al16 have highlighted a number of such mechanisms that have been considered by others, including: stress, changes in the immune system, endocrine changes, racism, diet and substance misuse. We are currently undertaking more detailed, smaller-scale work as a means of identifying particularly high- and low-risk populations in order that some of these potential mechanisms can be tested. However, the main aim of this research was to show that inequalities in very preterm birth still remain in the UK, and to emphasise the importance of undertaking further research in order to understand them. It also offers the ability to quantify socio-economic inequalities in very preterm birth based on data that could be collected routinely, and provides information for estimating service needs, monitoring inequalities over time and targeting interventions to those who need it most. Our study was also limited because the data on all births was only available at ward level. Wards are relatively large areas with arbitrary boundaries. It is possible that some of the effect we are seeing is artefactually related to the way in which these wards are constructed. It is also possible that the effect is underestimated compared with the deprivation gap that would be seen using smaller areas, such as enumeration districts or super output areas. We hope to undertake further research at the smaller area level and individual level in order to enhance this work. However, ward-level data can be a quick and inexpensive way for health professionals to monitor inequalities in very preterm birth. The increases in incidence of very preterm birth over time seen here are unlikely to be artefactually related to changes in the classification of stillbirths, late fetal losses and neonatal deaths because we used a consistent definition across the whole study period. Furthermore, they are not due to increases in multi-fetal pregnancies as we have focused on singleton births. A possible factor affecting the observed incidence is the introduction of new obstetric policies, which may lead to changes in the incidence of antepartum deaths, stillbirths and late fetal losses. For example, a policy that leads to earlier induction of labour may lead to more births being alive at the onset of labour, and classified as stillbirths or late fetal losses rather than as antepartum deaths. However, we found that stillbirth and late fetal losses decreased over the period, while antepartum deaths increased, so such a change in policy is unlikely to have brought about the overall increases in incidence. The use of ultrasonography instead of last menstrual period to estimate gestation, which happened increasingly during the course of the study period, may explain some of the observed increase in incidence of very preterm birth, as it is known to lower the estimated gestation. Differential access to ultrasonography may affect the observed deprivation gap. If women from more deprived areas have less access to ultrasonography it is possible that the underlying deprivation gap is actually larger, as there would be a systematical increase in the gestation estimate for deprived women, leading to an underestimate of very preterm birth in this group. Our study, despite being regionally based, represents just under a tenth of births in England and Wales, and is the largest ongoing, regional study that routinely collects gestational information as part of a wider study of neonatal services. The variation in deprivation across the wards in the Trent region described here is fairly representative of England and Wales, with the ranks of the Trent wards having a similar median and interquartile range. We would expect to see similar patterns of deprivation incidence nationally. If this were so, then the national deprivation gap in the burden of perinatal mortality and morbidity would be substantial, and research into strategies to reduce the incidence of very preterm birth and also the socio-economic inequalities is vital. The lack of routine data on gestational age has led to a paucity of research in socioeconomic inequalities in preterm birth. Incidence of low birthweight babies is higher in more deprived women but birth weight is a poor proxy for preterm birth. Women from very deprived areas are at twice the risk of very preterm birth as those living in the least deprived areas. Very preterm birth rates have increased for all deprivation groups over the past 10 years. We wish to acknowledge the continuing help and collaboration of the hospitals that deliver perinatal care in both Trent and in adjacent regions. This study is one of the Trent Infant Mortality and Morbidity Studies, which are funded by the Primary Care Trusts of the former Trent health region. Tucker J, McGuire W. Epidemiology of preterm birth. BMJ2004;329:675–8. Draper ES, Manktelow B, Field DJ, et al. Prediction of survival for preterm births by weight and gestational age: retrospective population based study. BMJ1999;319:1093–7. MacDorman MF, Minino AM, Strobino DM, et al. Annual summary of vital statistics—2001. Pediatrics2002;110:1037–52. Roberts CL, Algert CS, Raynes-Greenow C, et al. Delivery of singleton preterm infants in New South Wales, 1990–1997. The Australian and New Zealand Journal of Obstetrics and Gynaecology2003;43:32–7. Moser K, Li L, Power C. Social inequalities in low birth weight in England and Wales: trends and implications for future population health. J Epidemiol Community Health2003;57:687–91. Pattenden S, Dolk H, Vrijheid M. Inequalities in low birth weight: parental social class, area deprivation, and “lone mother” status. J Epidemiol Community Health1999;53:355–8. Vrijheid M, Dolk H, Stone D, et al. Socioeconomic inequalities in risk of congenital anomaly. Arch Dis Child2000;82:349–52. Dummer TJ, Parker L. Changing socioeconomic inequality in infant mortality in Cumbria. Arch Dis Child2005;90:157–62. Peacock JL, Bland JM, Anderson HR. Preterm delivery: effects of socioeconomic factors, psychological stress, smoking, alcohol, and caffeine. BMJ1995;311:531–5. Aszkenasy M, Hutchison S. Births, gestation and birthweights in South Tees 1990–1996. J Public Health Med2000;22:457–61. Aveyard P, Cheng KK, Manaseki S, et al. The risk of preterm delivery in women from different ethnic groups. BJOG2002;109:894–9. Craig ED, Thompson JM, Mitchell EA. 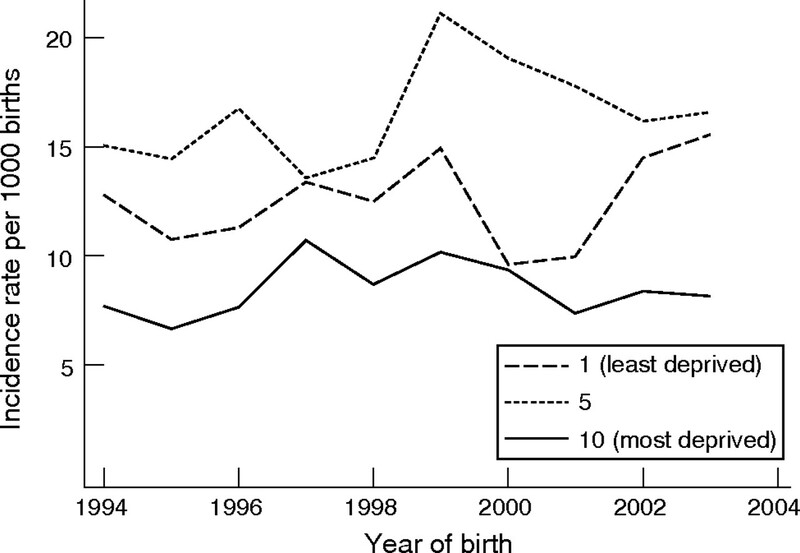 Socioeconomic status and preterm birth: New Zealand trends, 1980 to 1999. Arch Dis Child Fetal Neonatal Ed2002;86:F142–6. Department of Health Sciences. Trent Neonatal Survey. Trent Neonatal Survey Report. University of Leicester, 2003 http://www.hs.le.ac.uk/timms/TNS.htm. (accessed 17 October 2006). Clarke M, Draper E, James D, et al. Confidential enquiry into stillbirths and deaths in infancy (CESDI) 1998. Trent Infant Mortality and Morbidity Studies: Trent Institute for Health Services Research; 1999. Department for Transport, Local Government The Regions. Index of Multiple Deprivation 2000. London: The Stationery Office, 2000. Green NS, Damus K, Simpson JL, et al. Research agenda for preterm birth: recommendations from the March of Dimes. Am J Obstet Gynecol2005;193:626–35. ESD is supported by a grant from Leicestershire Health Authority. Archives of Disease in Childhood - Fetal and Neonatal Edition 2006; 92 F1-F1 Published Online First: 21 Dec 2006.